Tomomi Hanamure, a Japanese citizen who loved exploring the rugged wilderness of the American West, was killed on her birthday May 8, 2006. She was stabbed 29 times as she hiked to Havasu Falls on the Havasupai Indian reservation at the bottom of Grand Canyon. Her killer was an 18-year old Havasupai youth named Randy Redtail Wescogame who had a history of robbing tourists and was addicted to meth. It was the most brutal murder ever recorded in Grand Canyon's history. Annette McGivney covered the tragedy for Backpacker magazine where she is Southwest Editor and she wrote an award-winning article that received more reader mail than any story in the last decade. While the assignment ended when the article was published, McGivney could not let go of the story. As a woman who also enjoys wilderness hiking, McGivney felt a bond with Hanamure and embarked on a years-long pursuit to learn more about her. McGivney traveled to Japan and across the American West following the trail Hanamure left in her journals. Yet, McGivney also had a connection to Wescogame, Hanamure's killer, and her reporting unexpectedly triggered long-buried memories about violent abuse McGivney experienced as a child. 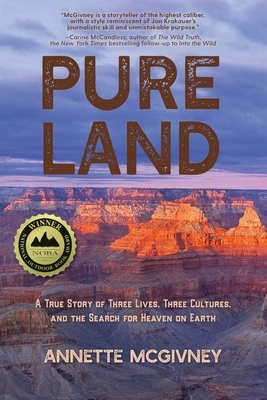 Pure Land is a story of this inner and outer journey, how two women in search of their true nature found transcendence in the West's most spectacular landscapes. It is also a tale of how child abuse leads to violence and destroys lives. And it is, ultimately, a story of healing. While chronicling Hanamure's life landed McGivney in the crime scene of her own childhood, it was her connection to Hanamure-- a woman she did not know until after Hanamure died -- that helped McGivney find a way out of her own horror.